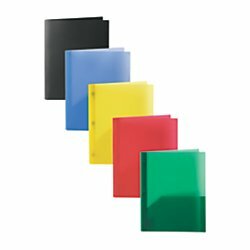 Flexible poly covers are virtually indestructible! Durable pockets expand to hold more than 50 sheets. Holds letter-size paper. Metal prong fasteners for secure closure. Product is available in multiple colors, option for color selection not available.